Calm, Forward, Straight: In the Arena #96 - I "rode the horse I have today".. now, may I please have the one I rode yesterday?! I think for horses that are a little out of shape (not unfit or competition fit) some of the trot work can be really tough at the start of a workout (especially following a really productive ride). I've noticed (at least with TBs) that they really thrive on loosening up their backs first (ie, a little easy cantering -- maybe with your weight off his back -- around to stretch so to speak), then resume work as usual. If there are no other glaring issues, it could just be a matter of strength and muscle tone on his part. Riding "the horse you have today" is so tough in practice!!!!!!! It doesn't sound like there is a medical issue. I agree that he might be sore from the excellent work. I don't know about Val (since horses vary quite a bit on this) but Jackson's work ethic and attitude improve dramatically if we have a chill day on the trail. Oh yeah. Everyone has those days. I agree that some cantering in half seat or a trail ride are both great remedies. As Harley has gotten older, he doesn't feel really nice in his trot until he canters, so I canter sooner in the ride than I used to. I hope you find out what's troubling him soon. And I know exactly what you mean about wanting someone more experienced there with you. But please remember to trust yourself--nobody knows Val better than you do. So... when you got off and chased him around, did he trot? Canter? Stretch himself out some? If so, that's probably part of why the walk was so nice and relaxed when you got back on. I wonder if he needed more warm-up at the walk before trotting this ride - for whatever reason. I like to see the horse tracking up fully and even over-tracking at the walk before I move to the trot - then sometimes if the trot is stiff I will canter just to loosen things up. Sometimes it's just one of those days/rides. Any little thing could be off with him or with you. You worked through it and have a plan for the next ride. : ) Thanks for this post! I had a less then stellar ride today and left a little frustrated. Reading your post, now I'm thinking "This is dressage and that is dressage horses." Good days and bad days, frustrating training sessions and magnificent ones. Someone once wrote: "The highs in dressage are so incredible, because the lows are so frequent". It sounds to me like he's medically fine. I find with any one of our horses that get worked regularly they need a longish warm up before they begin work. Hey, so do I! The other thing we try to do is mix it up a bit so it's not just doing the same old thing all the time. When we would take lessons the horses knew it was walk, trot, canter then jump then walk. Never really a change and they got bored. It always seems best to either give them a day off or do something fun. Like play games from the ground with them or go on a trail ride etc. Just like horses I get bored if I do the same thing everyday. Good luck. One day is no big deal, and it sounds like you guys more or less worked through it. What makes you a great, conscientious rider is that you analyze every ride though, as you should:) Just try not to worry too much. The important thing is that you got off, loosened him up and then got on again. We can't all be perfect every day -nor should we want to be. Perfect would be so boring. hey, i probably shouldn't come in here in the middle of things when i don't really know what's led up to this point, but i can confirm that, yes, we definitely all have 'those' days, so don't sweat it too much. you've got a good handle on things and some good observations and advice here. i'd also just add my main theory when working with horses, especially in dressage: it's common, especially when making progress with a horse, to want to continually keep building upon that progress; but horses aren't designed to work that way. they make a breakthrough, then they need to step back and do something they already know well, change the subject, have fun, relax, etc. before building back up to the newer, harder stuff. they can't be expected to pick up where they left off yesterday, and if they are just constantly pushed and drilled onward and upward, they may become tense, resistant, defiant and eventually crack or shut down. it sounds to me like you're on the right track. so try not to be discouraged by a frustrating ride here and there. just remember to mix it up and don't be afraid to take a step back when things don't go your way and reinforce and reward the good/old stuff before tackling the not-so-good/new stuff. I just love you and your dappled steed of yesterdays ride and also the current, not so perfected ride. It is one in the same, I do believe..it all adds up to progress. Many people said it eloquently, horses don't build upon the last ride session, taking off from the top of what was working. Val is a smarty, he remembers the right answers to your questions..but he seems that he needed a break from routine. Your title really made me chuckle. I pray that it is none of what you fear it could be, with a physical ailment. You do have such a handle on his pulse of health and well being..maybe he just is speaking to you about changing it up some. My sis is always trying to get me to give mine some Bute before ridng the arena (which I have not tried) maybe I shall. Let us know how that goes..but the whoop whoop, out of the saddle romp, was a good drug this time! Merry Christmas to you and yours, my dear. I adore your riding and reading of all the times you have. I don't have a solution, but you got lots of good advice. I just wanted to say that I think everyone has those days. All in all you guys have been doing great. Also, you handled it really well. Try not to worry :) Look at all you've accomplished, and mostly on your own. 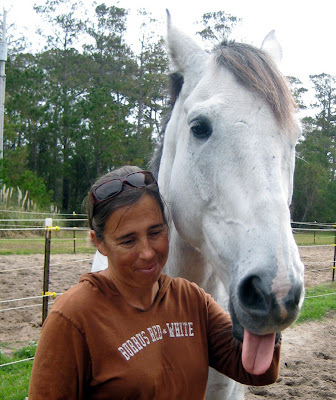 I wouldn't say that dressage is "supposed" to be hard, but rather that *riding* is hard, because you've got a thinking, feeling partner that just happens not to speak the same language. Don't beat yourself up too much - horses have bad days too! If you know it's not medical, he could have just needed a change of pace. Trail ride, longeing, maybe even a few poles on the ground? Something to break it up. XO to you C & V!! From W & KK ! You're not alone, I have rides that vary wildly from one day to the next. So does my trainer. Our horses are individuals, just like us. Some days they feel better than they do on others - I think this can be especially true of our beloved OTTBs. Anyway, kudos to you for recognizing that a different approach was needed. Bet you get right back to that good work, and I'll make another bet that good becomes habit. Love the new pic in your blog header too. Very nice! I just loved this detailed post about, well, an ordinary ride, let's face it. After all, it was just one ride, just you two talking, not talking, and you starting to overthink/worry and him starting to warm up when you let him. I always feel like I'm there, ringside, watching - that's how well you describe it.